Unacceptable meddling with the interior affairs of a member state! The European Union issued a one-month ultimatum to Hungary on Thursday to address its concerns over an education law it says runs counter to the bloc’s values or face possible sanctions in court. European Commission deputy head Frans Timmermans called for the Hungarian government to respond within a month to Brussels’ criticism that the Higher Education Law could shut down a Budapest university founded by U.S. financier George Soros. The EU executive has long been exasperated by what it sees as Prime Minister Viktor Orban’s authoritarian tendencies. In a “reasoned opinion” issued on Thursday, the second step in legal action against a member state for breaching EU rules, the Commission said the law “runs counter to the right of academic freedom, the right to education and the freedom to conduct a business”. The Commission also sent a letter to Hungary saying a new law governing foreign-funded non-government organizations did not comply with EU legislation, the first step toward legal action by the 28-country EU. While Brussels can open cases against EU states violating common rules, they are lengthy and often have little impact. That means the EU executive has limited leverage over Orban, who has been in office since 2010. 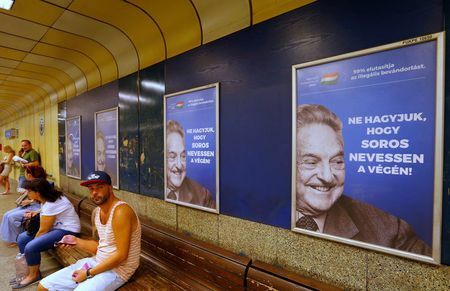 Orban has often bashed the EU and repeatedly clashed with non-governmental organizations sponsored by Soros, who promotes a liberal and internationalist world view that the Hungarian leader dislikes. The threat of legal action comes after months of dialogue between the Commission and Hungary over grievances that go beyond the higher education law.